Loopt, the location-based sharing service, has taken the logical next step for its system: Loopt on the iPhone now includes location-based advertising. We’ve been expecting this, but is it a sign the floodgates of location-ads are open? 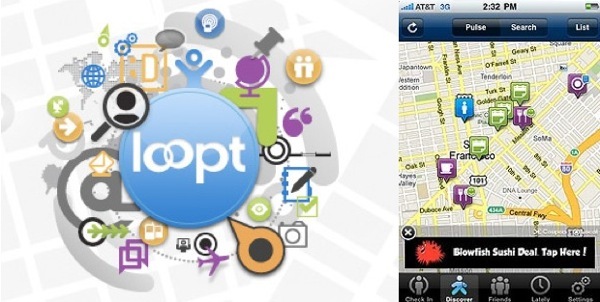 Loopt is in roughly the same game as Yelp, Foursquare, and a number of other players in location-based social networking. It’s also a little like Google Latitude, in that users can see in more-or-less real time where their friends are located (and what they’re up to, via status updates), rather than having to “check in” to specific locales like in Foursquare. So it’s really perfectly logical that it take the step to deliver specific location-based ads to its users in geolocated real time too. It’s partnered with Mobile Spinach to give its users special offers and discounts from businesses that are near their specific location–meaning that you’ll be able to get a discount by showing the Loopt alert message to a restaurant, for example. To start with it’ll only work in San Francisco, since Loopt is combining its user demographic data with Mobile Spinach’s list of local business to ensure that the right kind of service is delivered as an ad to its users, as well as being merely location-specific. Ultimately the system will roll out in New York, L.A,. and other U.S. cities, and it’ll become more sophisticated in time. This sophistication will actually give the advertising partners an amazing new vehicle for influencing sales: Say a coffee shop has a regular lull between 11 a.m. and lunchtime–it could time its Loopt-related discount ads to try to attract more drop-in trade at this time, or it could associate your Loopt account with a “10 drinks and the 11th is free”-type loyalty system. All of which means that the business of advertising is going to get ever-more deeply wormed into our daily lives. Because though not all of us are users of location-based social networking, it is clear that it’s an exploding phenomenon, and it’ll continue to be so as more and more of us carry around location-aware smartphones. The reason location-based ads will boom is that they enable a degree of precision in audience targeting that’s rarely been possible before, and that could mean lucrative returns for the companies concerned. And though your mind may be filled with Minority Report-style horror visions of nagging ads at every turn in a public street (assuming this tech develops to its highest possible level), this might actually be good for us as consumers: If you’re going to get ads served up to you, come what may, wouldn’t you prefer it if they’re actually for stuff you’re interested in? Oh, and one last thing: We know Apple’s going to be getting into the mobile ad game itself, thanks to its purchase of Quattro Wireless. It’s also recently forced developers to strip any location-based ad powers out of apps, indicating that it too will be playing in this space (and who better to exploit the full powers of the iPhone but its inventors?). But Loopt escapes this injunction because location-sensing is actually a core feature of the application. Meaning Apple is, for the time being, happy to have competition in location-based ads.